Originally these were going to be burritos. Having never wrapped burritos before, they turned out a little flat. I was hoping no one would notice, but as soon as I gave my husband his, he was all, “This doesn’t look like a burrito at all! Burritos are round!” So I decided rather than making them again, I’d just call them Sweet Potato & Kale Wraps. I’m lazy like that. These wraps were inspired by a recipe for Portuguese Burritos by MomFoodie. She had mentioned that she felt they were lacking something, so I decided to add a crapload of stuff to the burritos to add flavor. I didn’t want to add cheese, but I needed something to help bind the burrito together, hence the mashed sweet potatoes. I added black beans too and to replicate that smoky flavor the beans have at Mexican restaurants, I added a little smoked Spanish paprika to them. Caramelized onions clearly make everything better, so those went in too. I guess I kind of used a “throw enough things at the wall and eventually something will stick” approach to these burritos wraps. Luckily everything did stick and although they might sound a little bit weird, they were really good and super, super filling. 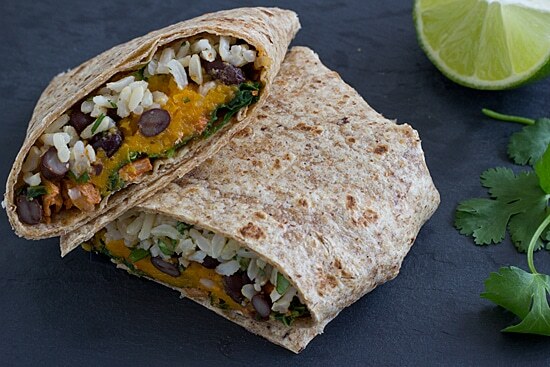 Not quite burritos, not quite wraps–these Sweet Potato & Kale Wraps are filled with caramelized onions, smoky black beans, brown rice and vegan chorizo. Inspired by MomFoodie’s Meatless Portuguese Burritos. Preheat oven to 400 degrees. Place sweet potato on a baking sheet or sheet of aluminum foil and roast for 40-60 minutes, or until tender and beginning to caramelize. Allow to cool slightly. When onion is almost caramelized, stir in crumbled chorizo. Continue to cook for 6-8 minutes, or until chorizo is beginning to brown. Add chopped kale and cover. Cook until kale is bright green and wilted, approximately 5 minutes more. Remove from heat. Remove sweet potato skin and mash insides in a small bowl. Season with salt and pepper. Combine rice, lime juice, cilantro, and salt in another bowl. In another bowl (last one, I promise! ), stir together black beans and paprika until beans are coated. To assemble, divide vegetable and chorizo mixture, rice, sweet potatoes, beans, and salsa among 4 tortillas. If you don’t know how to wrap a burrito, follow these handy dandy instructions. Hopefully I can tell the Mr it’s spinach because I think he’s going to go nuts if I try to find another way to sneak kale in!! Maybe with all the other great ingredients he won’t notice! 😉 Looks yummy! Ha! See, I’m the opposite–love kale, but spinach not so much. I’ll eat it, but the texture is just so… slimy. sweet potato is one of my favorite foods. I also love baked kale. I bet this is a great combination! Sweet potatoes and kale really do go well together–they are two of my favorites too! I love seeing the recipes you come up with! I would have never thought to add sweet potato to something like this, but it sounds like it worked! Makes for a pretty wrap too. My husband perked up at this picture! I’m going to have to make this one with real chorizo. Two of my favorite vegetables, sweet potatoes and kale! They are two of my favorites too! Don’t you love those times when throwing together everything you can think of turns out really well? I find that wraps are perfect for doing that! I don’t really know the difference between a burrito and a wrap either, but whatever these are called, they sound delicious! I really like the combination of ingredients you’re using for these. Delicious! That looks yummy. You eat so much better than I do! Thank you! I’m trying to lose weight & the only way I can stick to a diet is by cooking different things all the time. I hope they turn out well for you if you make them! I’m sure at the very least, you’ll manage to wrap them better than I did! Wraps or burritos, these look yummy!! I love the idea of chorizo for a little heat! If only I could get my husband to eat sweet potatoes!! Your husband doesn’t like sweet potatoes?! Oh, they are so good, I can’t imagine not liking them, ha! I’m a little late to the party, but I made these tonight and they were so good! We love kale, beans, and sweet potatoes in this house but I never thought to eat them all together. 🙂 Yum!